The Waratahs defeated their oldest rivals the Reds 15-11 at Sydney Football Stadium to climb to the top of the Super 14 pile. The Waratahs fourth win of the campaign was secured thanks to tries from Benn Robinson and Timana Tahu, coming from behind to cancel out a first-half try from the Reds' Peter Hynes. In a turgid game the Reds' pre-game taunts about their greater attacking ability were made irrelevant by the dominant defence exhibited. The Waratahs were ahead early; with Australia prop Benn Robinson sneaking over close to the posts after some concerted efforts from his fellow forwards. It fell to Hynes to drag the Reds into the lead after Ben Lucas had slotted two penalties to narrow the home side's lead to a point, the Wallaby winger crossing for a try with only seconds remaining on the clock in the first half. The Reds could have been further ahead just after the break, only for Lachie Turner to pull off a superb last-ditch tackle to deny fullback Mark McLinden. It was then Hynes' turn to play villain, spilling the ball and allowing Tahu to pounce. 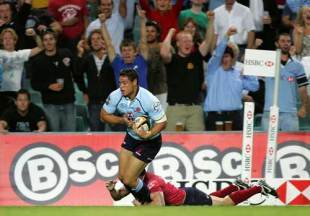 The Waratahs centre collected the ball and raced 40m to secure the points for his side. "It's a good win, we didn't play particularly well again but we got away with the win," NSW captain Phil Waugh said following the game. "It's a good start but we're not playing our best football yet so we've got still a lot of improving to do." Reds skipper Berrick Barnes insisted his side only had themselves to blame for defeat, commenting, "We probably killed ourselves not putting points on early in the second half. We created some chances but we just didn't take them." Waratahs: Sam Norton-Knight, Lachie Turner, Rob Horne, Tom Carter, Lote Tuqiri, Kurtley Beale, Luke Burgess, Wycliff Palu, Phil Waugh (capt), Ben Mowen, Will Caldwell, Dean Mumm, Al Baxter, Tatafu Polota-Nau, Benn Robinson. Replacements: Adam Freier, Dan Palmer, Chris Thomson, Dave Dennis, Brett Sheehan, Daniel Halangahu, Timana Tahu. Reds: Mark McLinden, Digby Ioane, Charlie Fetoai, Berrick Barnes (capt), Peter Hynes, Quade Cooper, Ben Lucas, Leroy Houston, Daniel Braid, Scott Higginbotham, Hugh McMeniman, Van Humphries, Dayna Edwards, Sean Hardman, Greg Holmes. Replacements: Saia Faingaa, Laurie Weeks, Adam Byrnes, Poutasi Luafutu, Will Genia, Anthony Faingaa, Blair Connor.